Catch a ride with FLOW Adventures. For the youngest among us, the Spokane Canoe and Kayak Club has a special event designed to introduce kids to all sorts of paddling. On Saturday, Aug. 5 from 10 am to 2 pm, the club will have canoes, sea kayaks, standup paddleboards, and inflatable, recreational and whitewater kayaks available to try out at the Nine Mile Recreation Area. The best part? It's free. Some people like to spend hours pumping their arms to move through the water, but tubers know there's another option: go with the flow. 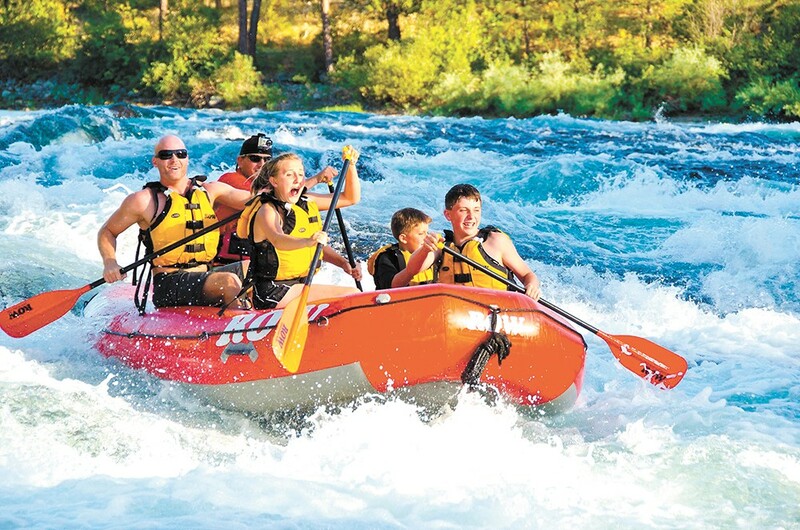 With the Spokane River right in your backyard, all you've got to do is rent a tube (or bring your own), make sure you have a PFD, and get thee to the water. There are multiple options for transportation: FLOW Adventures offers a package deal where you can rent a tube, PFD, and get a ride to the launch point in their shuttle for $20. Meet the shuttle at the TJ Meenach Bridge parking lot (where you'll end up at the end of your float) and hitch a ride east to start your roughly two-hour float. More information and times can be found at flow-adventures.com. You can also park one vehicle for your group (large enough for tubes and supplies) at the end, and drive yourselves to a good launch point. This involves more driving to get everyone back to their cars, but might save you a few bucks depending on how large your group is. ROW Adventures offers a variety of trips. From lakes to rivers, there are plenty of places in the area to put in and get your paddle on. Have your own gear, but don't want to take two cars? Spokane Parks and Recreation will offer a shuttle on the Little Spokane River on Saturdays from 10 am to 4 pm. The cost is $8 per person to take you, your boats and your gear from the Nine Mile Falls takeout to where you'll want to put in at St. George's. No cash will be accepted on-site, but you can pay there with check, credit or debit card, or pre-register at spokaneparks.org. 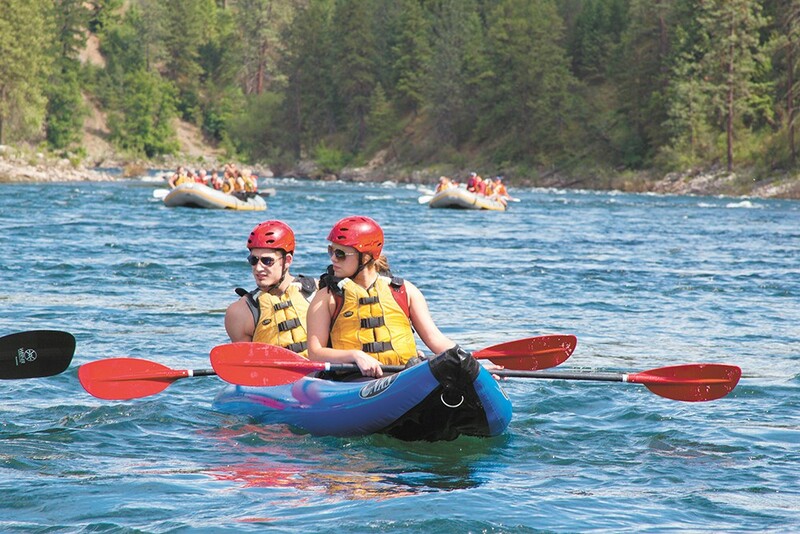 Throughout the summer, Spokane Parks and Rec crews plan to lead several guided kayak trips, with equipment and sometimes other perks provided. New this year is a kayak trip and tour of Riverview Organic Orchard in Kettle Falls, where the group will paddle part of the Columbia River, then learn about organic peaches, apples, cherries, nectarines, pears and plums. The 18-and-older full day trip is $59 per person, and includes transportation, the tour, samples, equipment, and guides. Closer to Spokane, take to the Little Spokane River one Saturday, whether that's on a family paddle (8 and older, $27-$29 per person) or on one of the coffee mornings sponsored by Rocket Bakery (18 and older, $29 per person). More at spokaneparks.org. Or head on over to Idaho and take a paddle on Lake Coeur d'Alene with one of ROW Adventure Center's trips. Take a half-day tour to see wildlife and trees, and learn about the area (kids ages 5 to 11 can go with an adult; youths 12 and older can paddle their own boat: $69 for adults, $62 for youths). Or take a two-hour sunset tour and share a toast (cider for the kiddos, Champagne for the adults) for $54 a person, $47 for youths. The sunset tour may take place on Fernan Lake, depending on the weather. More information on the tours is available at rowadventurecenter.com. While you've got North Idaho on your mind, if you've never been, Lake Pend Oreille and Priest Lake are must-sees. Bored with squirt-gun wars and running through the sprinkler? Take a note straight out of summer camp guidebooks and have a slippery watermelon race. Coat a giant watermelon in shortening, find some waist-deep water, and split into teams. The goal is to get the watermelon across the other team's goal line, but it can't be lifted out of the water, and dang it, that thing is hard to get a good hold on. If you do this in your parents' pool, don't tell your mom that we told you about this game. Granite Point on the Snake River. OK, so you like to be near water, or ride around on top of it, but you want an adventure where you don't have to be in it? We've got one for you. Coeur d'Alene Parasail offers you the chance to fly right over the waters of Lake Coeur d'Alene, and because of the way you launch from the boat, you don't even have to get wet if you don't want to. Pricing depends on how high you want to go (600 feet or 800 feet) and whether you go up with a friend or by yourself. The range is between $65 and $125. You can make reservations and find more information at cdaparasail.com; just know that the business isn't open on Saturdays, but operates Sunday through Friday, all summer long. Takeoff is from the only dock off the city's beach. 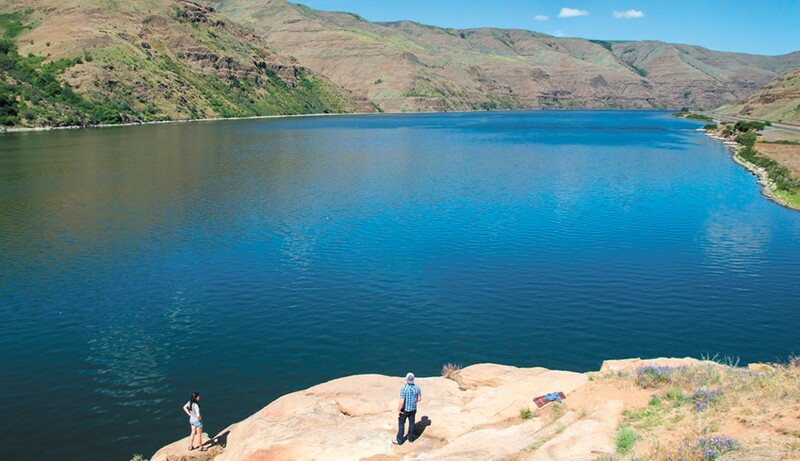 Granite Point on the Snake River is a summertime favorite for anyone living in the rolling hills of the Palouse, accessible by a drive of less than two hours, even if you're coming from Spokane. Legally speaking, this is a place where you can hang out on the cliffs, drink (if you're of age), put in kayaks, or swim, but you're not supposed to jump off the cliffs. The local Army Corps of Engineers office, which has jurisdiction over that land, warns that cliff jumping isn't allowed at Granite Point, and can be deadly. That said, on any given sunny day, you're likely to see people leaping into the water there anyway. The highest jumping spots are about 30 feet up, but there are lower jumps where you'll find people not inclined to venture quite that high. When you're preparing to hang out at the cliffs, be ready for body-shockingly cold water, and as with any swimming, make sure there is plenty of depth if you do decide to jump in. Not from the cliffs, of course (finger wag). Sunscreen is also a necessary companion. To get there from Spokane: take Highway 195 south toward Pullman, then take a right on Wawawai-Pullman Road. Follow that until you reach the river and head left. OK, so you've lived here forever, and you're sick of chasing waterfalls, but don't want to stick to the rivers and lakes that you're used to. How about jumping two state lines, or an international border, to mix things up? Within three or four hours, there are multiple hot spring resorts where you can take all that pent-up energy and let it go in the natural mineral waters of the magnificent mountains. If you want to stay in the U.S., think about taking the three-hour drive to Quinn's Hot Springs Resort in Paradise, Montana, with multiple pools open daily. The cost for people who aren't staying at the resort is between $11 and $13 per person, per three-hour session (they break the day up into three-hour chunks, meant to prevent overcrowding).